But a heart-shaped ring galaxy? 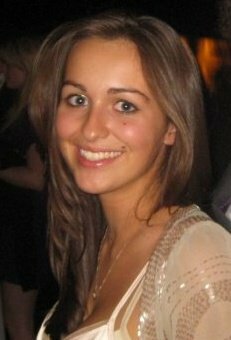 My name is Georgia Barrie and I’m a Masters student at Oxford University. I’m currently working on a research project with Chris Lintott, attempting to explain the formation of the elusive ring galaxies. 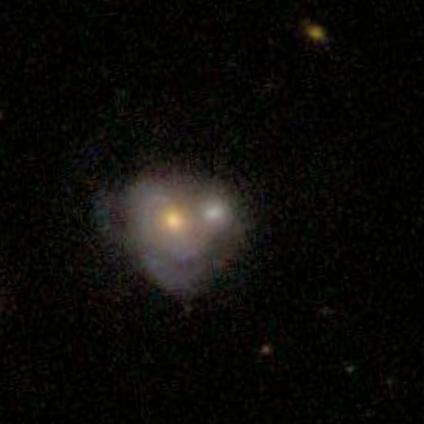 Thanks to the work of Galaxy Zoo users, I am now in possession of the biggest catalogue of ring galaxies in the World. Having looked through each of the three and a half thousand galaxies classified as rings by Galaxy Zoo users, I am lucky enough to have seen some of the weirdest and most wonderful galaxies in the Zoo. Rings come in all shapes and sizes and over the next few weeks I will share with you some of the most beautiful, unusual and mystifying rings in our Universe. As today is Valentine’s Day I will start with this astounding heart shaped merger. This beautiful object was first discovered by teckborg on July 26 2007 and was posted on the forums shortly afterwards by ALKA on August 14. It looks as though this galaxy is made up of two intertwined ring galaxies with one ring appearing to be red and the other appearing to be quite blue. We’ve calculated that this galaxy is about 600 million light years away but the formation of an object like this is, quite literally, a mystery. For something as baffling as this we really need your help. 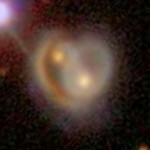 Today the Heart Galaxy is our featured merger and we need you to help us simulate how this incredible galaxy could be created. To get involved go to the Galaxy Zoo Mergers site and, who knows, you may be the very person to solve this cosmic mystery! If you want to hear more about the Heart Galaxy then I will be talking about this amazing discovery live on Monday’s Breakfast Show, BBC Radio Oxford. *The Galaxy Zoo team has just recently discovered a population of red spiral galaxies. Click here to find out more! Looks like a heart-shaped Yin Yang emblem to me. Maybe a Buddhist Valentine? Ask Tsering. wow wot a cool thing to find in the universe you must have been shockrd at the time will it be called valentines Galaxy???? Thank you, Georgia. The heart ring galaxies look superb for the occasion. A happy Valentine’s Day to ALL ! Also a happy & prosperous Year of the Tiger to all Zooites . Just to let you know that the interview we did for Sundays show also got a mention on Radio 4 later in the day. You can listen again via the link. It was on about 0740hrs. Sounded great. Thanks for letting us know, Phil…and thanks for the publicity. Aaaaah that galaxy ain’t heart shaped, more like upside down spade shaped. Keep up the good work though, your project sounds better than kamau’s. It’s almost as pretty as you Georgia!! I finally got a chance to look at your Georgia’s Heart web post. Just brilliant! I hope you are having a rewarding time in Moshi.